The international Spitzer Adaptation of the Red-sequence Cluster Survey (SpARCS) collaboration based at the University of California, Riverside has combined observations from several of the world’s most powerful telescopes to carry out one of the largest studies yet of molecular gas — the raw material which fuels star formation throughout the universe — in three of the most distant clusters of galaxies ever found, detected as they appeared when the universe was only four billion years old. Results were recently published in The Astrophysical Journal Letters. Allison Noble, a postdoctoral researcher at the Massachusetts Institute of Technology, led this newest research from the SpARCS collaboration. Clusters are rare regions of the universe consisting of tight groups of hundreds of galaxies containing trillions of stars, as well as hot gas and mysterious dark matter. First, the research team used spectroscopic observations from the W. M. Keck Observatory on Mauna Kea, Hawai’i, and the Very Large Telescope in Chile that confirmed 11 galaxies were star-forming members of the three massive clusters. Next, the researchers took images through multiple filters from NASA’s Hubble Space Telescope, which revealed a surprising diversity in the galaxies’ appearance, with some galaxies having already formed large disks with spiral arms. One of the telescopes the SpARCS scientists used is the extremely sensitive Atacama Large Millimeter Array (ALMA) telescope capable of directly detecting radio waves emitted from the molecular gas found in galaxies in the early universe. ALMA observations allowed the scientists to determine the amount of molecular gas in each galaxy, and provided the best measurement yet of how much fuel was available to form stars. The researchers compared the properties of galaxies in these clusters with the properties of “field galaxies” (galaxies found in more typical environments with fewer close neighbors). To their surprise, they discovered that cluster galaxies had higher amounts of molecular gas relative to the amount of stars in the galaxy, compared to field galaxies. 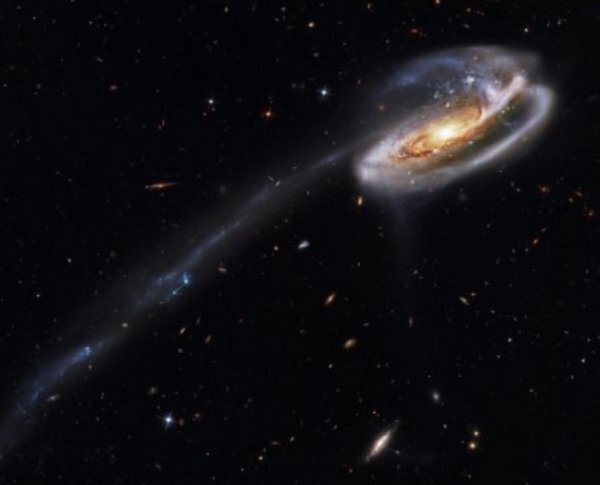 The finding puzzled the team because it has long been known that when a galaxy falls into a cluster, interactions with other cluster galaxies and hot gas accelerate the shut off of its star formation relative to that of a similar field galaxy (the process is known as environmental quenching). Noble, a SpARCS collaborator and the study’s leader, suggests several possible explanations: It is possible that something about being in the hot, harsh cluster environment surrounded by many neighboring galaxies perturbs the molecular gas in cluster galaxies such that a smaller fraction of that gas actively forms stars. Alternatively, it is possible that an environmental process, such as increased merging activity in cluster galaxies, results in the observed differences between the cluster and field galaxy populations. “While the current study does not answer the question of which physical process is primarily responsible for causing the higher amounts of molecular gas, it provides the most accurate measurement yet of how much molecular gas exists in galaxies in clusters in the early universe,” Wilson said. The SpARCS team has developed new techniques using infrared observations from NASA’s Spitzer Space Telescope to identify hundreds of previously undiscovered clusters of galaxies in the early universe. In the future, they plan to study a larger sample of clusters. The team has recently been awarded additional time on ALMA, the W. M. Keck Observatory, and the Hubble Space Telescope to continue investigating how the neighborhood in which a galaxy lives determines for how long it can form stars.